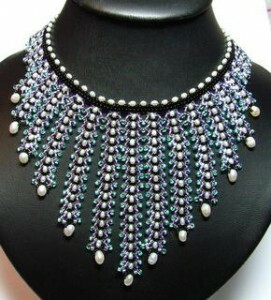 This glamorous choker is made using a twin chain version of the traditional Russian beading technique (using beading needles and thread) called St Petersburg Chain. Fiona has devised a way to join these twin chains together, so that each chain can hang vertically, resulting in elegant flowing lines of beads and pearls. 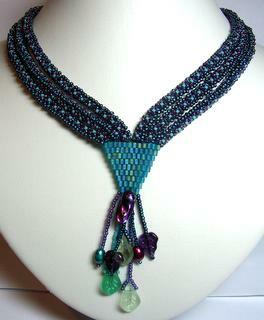 A two-bead peyote stitch band, embellished with pearls, supports the St Petersburg Chains. This choker design is based on Fiona’s Highly Commended original design “Ode to Maria” which she made especially for the Maria George 50th anniversary competition in 2007. This project is aimed at intermediate level beaders, but it has been successfully made by beaders quite new to threadwork. Kit cost: $70 plus postage (I recommend Express Post as this ensures that the parcel can be tracked throughout Australia – the kit fits in the smallest Express Post satchel). The kit includes all beads, needles and thread required to complete the choker, plus comprehensive printed notes with colour diagrams and photos. To purchase this kit, please email Fiona on fiona@chiatanyadesigns.com.au and put Midnight Moonlight Choker Kit in the subject line. NB: This kit is available in strictly limited numbers due to the difficulty and cost of sourcing the small rice pearls needed for this design. This project uses several traditional off-loom beadweaving techniques (right angle weave (RAW), brick stitch and fringing) with a special form of embellishment on the RAW ropes. Although RAW is often embellished on one side, I believe that a very talented beader in the United States – Melanie Doerman – developed the double-sided criss-cross embellishment technique. When I first saw it I knew it was exactly the technique I needed to fulfil my design for “Elegance”. When you master Melanie’s innovative technique you’ll be rewarded with intriguing rounded RAW ropes. Kit cost: $45 plus postage (I recommend Express Post as this ensures that the parcel can be tracked throughout Australia – the kit fits in the smallest Express Post satchel). The kit includes all beads, beading needles and thread required to complete the necklace, plus compehensive printed notes with colour diagrams and photos. To purchase this kit, please email Fiona on fiona@chiatanyadesigns.com.au and put Elegance Necklace Kit in the subject line. NB: If you want to make your necklace substantially longer than 45.5 cm, you may need to purchase extra beads – contact me for costs.